I have a weakness for faux cheese. I like anything with that fake cheesy tangy flavor. I agree w/ DJ that Cheez Doodles are amazing. I can’t get enough of them. Hard to beat Cheetos, though; they’ve really mastered it. 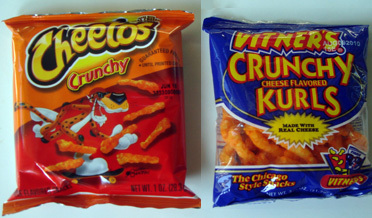 But do the Crunchy Kurls make your fingers orange? Cheetos are definitely better. I’ve found that some of the off-brand versions of Cheetos are usually lacking cheesy flavor. Vitners are unique as they don’t try to be a knock off. Nothing they make comes close to the original. They are their own taste. Which is good or bad depending on your own taste.